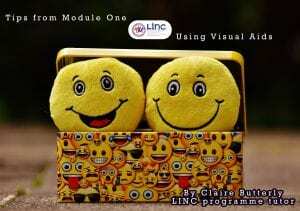 In this edition of the LINC blog, programme tutor Claire Butterly revisits a lesson from module one, highlighting some nice examples of visual aids she has observed in the field. Throughout Module 1, Inclusion in the Early Years: Concepts and Strategies, students learn about the importance of visual aids to support the well-being and inclusion of all children within the group. As a result of this new learning, many students decide to introduce visual aids into their early years classroom and other rooms within their service. Common visual aids which I have seen on mentoring visits include visual schedules. These are visual representations of a routine carried out regularly in the room, which use task analysis to break down an activity, such as using the toilet or handwashing into its component parts. While on a mentoring visit with Nicole Concannon, a LINC student from Kildare last year, I witnessed some innovate visual aids in practice. Two key visual aids being used were a task analysis for asking a friend to play and a friendship box. The task analysis for entering play showed the children how to ask permission to play. It consisted of a number of photos, each acted out by children in the group. The images could include one child asking another if they could enter, a child handing another child a toy and a child sitting down to play with the other children. Depending on the group of children, this task analysis could be added to by including photos of timers for children that have difficulty sharing toys. It could also include a photo of the early childhood teacher to encourage the child to ask for help if still experiencing difficulty in joining play. Nicole told me at her mentoring visit that her friendship box is helping the children in her room to develop empathy, as well as showing children ways to make a friend feel better if they are sad or out of sorts. Using visual aids such as the ones mentioned above can support the child in developing a sense of independence and autonomy within the classroom.